After five minutes in the new S80 I find myself wondering why we don't see more of them on the road  Volvo makes some very nice cars. It's a question I already knew the answer to but we'll get back to that in a bit. Let's talk about the car first. This is the new or rather updated Volvo S80 that was launched today at Rs 41.35 lakh ex-Delhi. It's not a big update and aside from some tweaks to the grille and bumpers the car remains largely the same. As a result the S80 remains a subtle (almost boring) but sophisticated design. The rear end is the most charismatic angle with a strong shoulder line, angular lamps and twin exhaust pipes. Volvo offers a choice of interior colours and our car came in a practical shade of black with wood inserts all around. 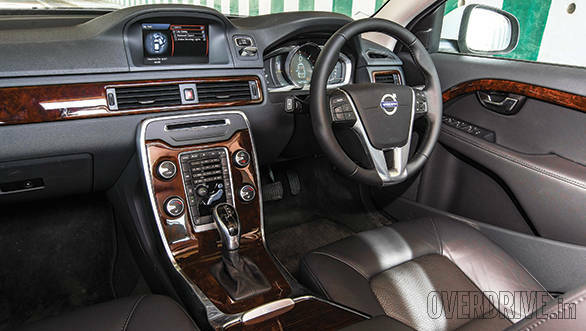 The interiors remain clean and uncluttered with the trademark Volvo floating centre console being the highlight. The button layout is minimal but completely user friendly. The big change on the inside is the adoption of a fully digital instrument cluster that uses rich colours and is quite customizable. You can select different layouts that reflect efficient driving or that you feel like some performance. Volvos generally have great ergonomics and the new S80 is no exception. The driving position is spot on, the seats are sculpted but comfortable and the rear is spacious and comfy. Build quality is up to the mark in most parts but a couple of iffy areas like the insufficient damping for the glove box and the rear armrest stand out. The new S80 will continue to be offered with the D5 and D4 diesel engines. 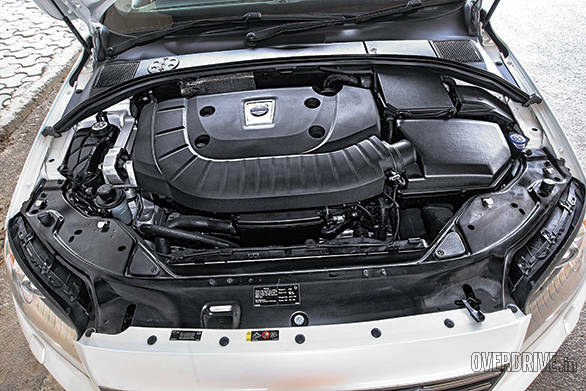 Our test car is equipped with the D5, a 215PS/440Nm 2.4-litre 5- cylinder diesel. This engine sits perfectly in the middle ground between the 4 and 6-cylinder diesel engines from Audi and BMW. The engine is quiet at low revs but gets progressively louder as you go higher up the rev range. The good news is that this noise is actually quite enjoyable. The 5-cylinder layout produces a unique and gruff warble that sounds quite sporty. It's one of the nicest sounding diesels on the market. Fortunately, the S80 is quick enough to justify the noise  the car needs just 7.8 seconds to hit 100kmph from a standstill and is limited to a top speed of 225kmph. The S80 continues to use a 6-speed torque convertor automatic. It may not have the same crisp and quick shifts of BMW's 8-speed auto but shifts arrive when asked for and the box is smooth and refined. We squeezed 10.8kmpl out of the S80 in city and managed to raise that number to 17.5kmpl on the highway. That results in an overall 12.5kmpl which is slightly higher than what a Mercedes-Benz E250 CDI offers. 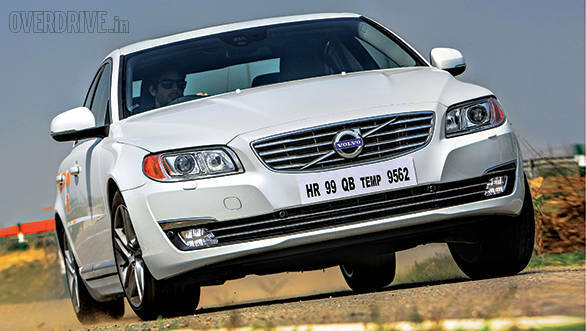 For India, Volvo has specced the S80 with their 'Comfort Suspension'. Ride quality is supple, although slightly sharp at low speeds. Go over one of those composite speed breakers or an expansion gap and the suspension reacts with a small thud. However the ride improves as the speed rises and the car feels wonderfully stable and absorptive at higher cruising speeds. The steering doesn't feel overtly light and is responsive, quick and reasonably direct. There is an unusual, almost non existent low frequency vibration through the wheel. You won't notice at first but after an hour in Delhi's bumper to bumper traffic it did start to become an irritant. On the plus side the S80 is a very nice car to drive in the city with a smooth throttle progression, strong but progressive brakes and good visibility. The S80 is a stable handler though not very exciting given the luxury theme and front-wheel drive layout. There's plenty of grip through corners and understeer is well restrained. The 17-inch wheels are wrapped in very silent rubber that refuse to squeal unless you push the car hard into understeer  which takes considerable effort. Volvo's USP of safety shines through in the S80. The IntelliSafe function will brake for you if it thinks the car is about to crash into another one ahead. The system is non intrusive and will only function if it thinks a crash is imminent  I tried provoking it but chickened out and hit the brakes before the system deemed it necessary. The bending headlamps help you see better through corners at night while the advanced ESP system keeps everything stable and confident. If safety is your priority, look no further than the S80. There are two reasons most buyers in the segment tend to look beyond the S80. Price isn't one of them. Why the S80 hasn't been successful so far is that it lacks the visual drama of its younger sibling the S60. And that becomes a problem when one of the prime reasons people buy such cars is to be seen in them. The second issue is they only have 12 dealers nationwide; considerably less than the competition. Volvo appears to be keen about their India plans but the number of dealerships doesn't reflect it. And that's a shame because the S80 is a very accomplished rival to the best of the segment. It's a car aimed at the thinking man who's not a fan of flamboyance. The problem is that our market has very few such customers.